Ora Ray Houghton married Hilda Haag in circa 1929 age 24 and 19. Alfred E. Houghton married Emma (?) in circa 1882 mar 18 y in 1910 census. Emma (?) married Alfred E. Houghton in circa 1882 mar 18 y in 1910 census. Alfred Garland Houghton married Myrtle M. (?) in circa 1926 age 36 and 28. Grace M. (?) married Andy George Haughton, son of George H. Haughton and Trese (?). Sylvester G Haughton married Dorothy L. Peters. Violet Marie Houghton married George Alexander Chriestenson in Aug 9, 1930 at Woodward, OK, USA. Violet Marie Houghton married Leo Elsworth Worley in Sep 9, 1953. Emma Faye Houghton married Frey Claremont Swaney. Gertrude (?) married Charles N. Houghton, son of Delos Newell Houghton and Caroline Glenville Maxfield, in circa 1909 mar 1 y in 1910 census. Death Nov 13, 1982 Bountiful, Davis Co., UT, USA, of complications arising from Parkinson's disease. 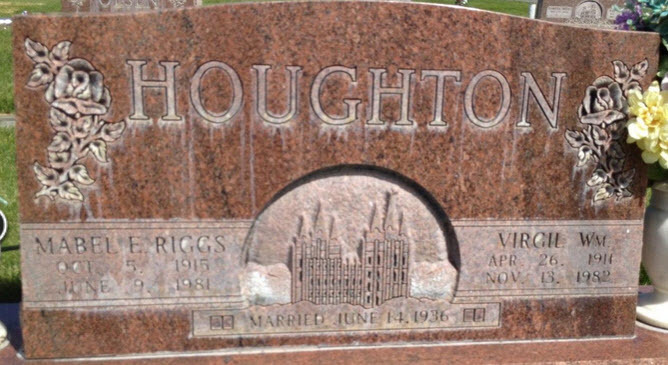 Virgil William Houghton married Mabel Edith Riggs in Jun 14, 1936 at WaKeeney, Trego Co., KS, USA. Eunice Houghton married Marion Conley. Harriet Allen married Edgar Fairbanks Houghton, son of George Fairbanks Houghton and Mary Jane Waterbury Barber, in Dec 2, 1889 age 36 and 35. Sereno George Houghton married Winifred Rhinebarger in circa 1923 age 21 and 23. Cecil Edgar Houghton married Edith Esther Culver in Nov 3, 1927 both age 19. Cecil Edgar Houghton married Margery Iris Catherine Alsdorf in Dec 30, 1965 at King, WA, USA. Edna Alberta Woiseley married Edward Waldo Houghton, son of William H. Houghton and Florence E. Farr, in circa 1909 mar 1 years in 1910 census.